Luxury tendon boots for the front and hind legs from the Platinum Pure collection of Eskadron. 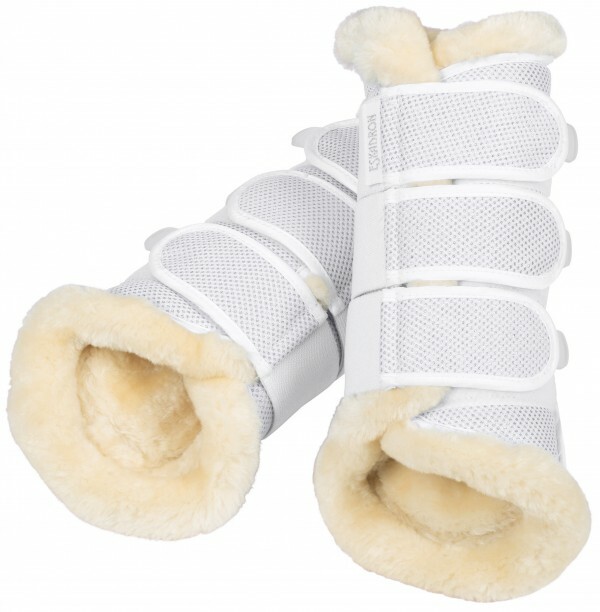 The tendon boots have a lining of imitation fur and a shimmering and strong outside of Mesh Glitter. The lining provides a good drainage of heat to prevent overheating of the leg. It also helps to prevent chafing and ensures a good pressure distribution. The tendon boots are easy to put on and off via the velcro closures. On the velcro closures is glossy material (mat satin). At the velcro closures is an Eskadron logo. Machine washable at 30 degrees and dirt repellent. Packed per pair. Available in the colour white. The pony size has 2 velcro closures instead of 3. The tendon boots in fullsize can also be used for the rear legs of a pony.